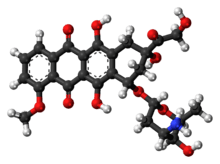 Doxorubicin, sold under the trade names Adriamycin among others, is a medication used in cancer chemotherapy. It is commonly used in the treatment of a wide range of cancers, including hematological malignancies (blood cancers, like leukaemia and lymphoma), many types of carcinoma (solid tumours) and soft tissue sarcomas. It is often used in combination chemotherapy as a component of various chemotherapy regimens. Common adverse effects of doxorubicin include hair loss (seen in most of those treated with the drug), myelosuppression (a compromised ability of the body's bone marrow to produce new blood cells), nausea and vomiting (which are seen in roughly 30-90% of people treated with the drug), oral mucositis, oesophagitis, diarrhoea, skin reactions (including hand-foot syndrome) and localised swelling and redness along the vein in which the drug is delivered. Less common reactions include hypersensitivity reactions (including anaphylaxis), radiation recall, heart damage and liver dysfunction. Some people experience red discoloration of their urine, sometimes for up to 1 to 2 days after treatment. It is an anthracycline antitumor antibiotic (note: in this context, this does not mean it is used to treat bacterial infections) closely related to the natural product daunomycin. Like all anthracyclines, its primarily works by intercalating DNA. Its most serious adverse effect is life-threatening heart damage. Doxorubicin is on the World Health Organization's List of Essential Medicines, the most important medication needed in a basic health system. The drug is administered intravenously as a hydrochloride salt. Doxorubicin is photosensitive, and containers are often covered by an aluminum bag and/or brown wax paper to prevent light from affecting it. Doxorubicin is also available in liposome-encapsulated forms as Doxil (pegylated form), Myocet (nonpegylated form), and Caelyx, although these forms must also be given by intravenous injection. Doxorubin is made from the bacteria Streptomyces peucetius. Doxorubicin is commonly used to treat some leukemias and Hodgkin's lymphoma, as well as cancers of the bladder, breast, stomach, lung, ovaries, thyroid, soft tissue sarcoma, multiple myeloma, and others. Commonly used doxorubicin-containing regimens are AC (Adriamycin, cyclophosphamide), TAC (Taxotere, AC), ABVD (Adriamycin, bleomycin, vinblastine, dacarbazine), BEACOPP, CHOP (cyclophosphamide, hydroxydaunorubicin, vincristine, prednisone) and FAC (5-fluorouracil, adriamycin, cyclophosphamide). There is a pegylated (polyethylene glycol coated) liposome-encapsulated form of doxorubicin, sold as Doxil. It was developed to treat Kaposi's sarcoma, an AIDS-related cancer that causes lesions to grow under the skin, in the lining of the mouth, nose and throat, or in other organs. The polyethylene glycol coating results in preferential concentration of doxorubicin in the skin. However, this also results in a side effect called palmar plantar erythrodysesthesia (PPE), more commonly known as hand-foot syndrome. Following administration of this form of doxorubicin, small amounts of the drug can leak from capillaries in the palms of the hands and soles of the feet. The result of this leakage is redness, tenderness, and peeling of the skin that can be uncomfortable and even painful. In clinical testing at 50 mg/m2 dosing every 4 weeks, half of people developed hand-foot syndrome. The rate of this side effect limits the dose of this formulation that can be given as compared with plain doxorubicin in the same treatment regimen, thereby limiting potential substitution. Substitution would be desirable because liposome-encapsulated doxorubicin is less cardiotoxic than unencapsulated doxorubicin. This form is also approved by the FDA for treatment of ovarian cancer and multiple myeloma. A non-pegylated liposomal doxorubicin, called Myocet, is approved in Europe and Canada for treatment of metastatic breast cancer in combination with cyclophosphamide, but has not been approved by the FDA for use in the United States. Unlike Doxil, the Myocet liposome does not have a polyethylene glycol coating, and therefore does not result in the same rate of hand-foot syndrome. The minimization of this side effect may allow for one for one substitution with doxorubicin in the same treatment regimen, thereby improving safety with no loss of efficacy. Like Doxil, the liposomal encapsulation of the doxorubicin limits the cardiotoxicity. In theory, by limiting the cardiotoxicity of doxorubicin through liposomal encapsulation, it can be used safely in concurrent combination with other cardiotoxic chemotherapy drugs, such as trastuzumab. There is an FDA black box warning that trastuzumab cannot be used in concurrent combination with doxorubicin, only in sequential combination. Though concurrent combination of trastuzumab and doxorubicin in clinical studies found superior tumor response, the combination resulted in unacceptable cardiotoxicity, including risk of cardiac failure manifesting as congestive heart failure (CHF). Published phase II study results have shown that Myocet, trastuzumab, and paclitaxel can safely be used concurrently without the cardiac risk, as measured by reduction in LVEF function, while still achieving superior tumor response. This finding is the basis for the ongoing phase III trial for FDA approval. The most dangerous side effect of doxorubicin is cardiomyopathy, leading to congestive heart failure. The rate of cardiomyopathy is dependent on its cumulative dose, with an incidence about 4% when the dose of doxorubicin is 500–550 mg/m², 18% when the dose is 551–600 mg/m² and 36% when the dose exceeds 600 mg/m². There are several ways in which doxorubicin is believed to cause cardiomyopathy, including oxidative stress, downregulation of genes for contractile proteins, and p53 mediated apoptosis. The drug dexrazoxane is used to mitigate doxorubicin's cardiotoxicity. Another common and potentially fatal complication of doxorubicin is typhlitis, an acute life-threatening infection of the bowel. Additionally, some patients may develop PPE, characterized by skin eruptions on the palms of the hand or soles of the feet, swelling, pain, and erythema. Diagram of two doxorubicin molecules intercalating DNA, from PDB: 1D12​. Doxorubicin interacts with DNA by intercalation and inhibition of macromolecular biosynthesis. This inhibits the progression of the enzyme topoisomerase II, which relaxes supercoils in DNA for transcription. Doxorubicin stabilizes the topoisomerase II complex after it has broken the DNA chain for replication, preventing the DNA double helix from being resealed and thereby stopping the process of replication. It may also increase quinone type free radical production, hence contributing to its cytotoxicity. By intercalation, doxorubicin can also induce histone eviction from transcriptionally active chromatin. As a result, DNA damage response, epigenome and transcriptome are deregulated in doxorubicin-exposed cells. In the 1950s, an Italian research company, Farmitalia Research Laboratories, began an organized effort to find anticancer compounds from soil-based microbes. A soil sample was isolated from the area surrounding the Castel del Monte, a 13th-century castle. A new strain of Streptomyces peucetius, which produced a red pigment, was isolated, and an antibiotic from this bacterium was effective against tumors in mice. Since a group of French researchers discovered the same compound at about the same time, the two teams named the compound daunorubicin, combining the name Dauni, a pre-Roman tribe that occupied the area of Italy where the compound was isolated, with the French word for ruby, rubis, describing the color. Clinical trials began in the 1960s, and the drug was successful in treating acute leukemia and lymphoma. However, by 1967, it was recognized that daunorubicin could produce fatal cardiac toxicity. Doxorubicin and daunorubicin together can be thought of as prototype compounds for the anthracyclines. Subsequent research has led to many other anthracycline antibiotics, or analogs, and there are now over 2,000 known analogs of doxorubicin. By 1991, 553 of them had been evaluated in the screening program at the National Cancer Institute (NCI). In 2016 GPX-150 was granted Orphan Drug designation by US FDA. It is also known as hydroxydaunorubicin and hydroxydaunomycin. It is sold under a number of different brand names, including Adriamycin PFS, Adriamycin RDF, or Rubex. As of February 2014, Doxil was available in limited supply. In 2011, Doxil became available only in very limited supply due to production problems with the third-party manufacturer. Johnson & Johnson (JNJ), through its subsidiary Janssen Products, LP, had been receiving its Doxil supply from contract manufacturer Ben Venue Laboratories (located in Bedford, Ohio), a unit of Boehringer Ingelheim GmbH of Germany. The problems began when Ben Venue temporarily shut down their manufacturing facility due to quality control issues. In February 2012, to address the Doxil shortage, the US Food and Drug Administration (FDA) allowed for the temporary importation of Lipodox, which contains the same active ingredient as Doxil and is made by Sun Pharma Global FZE (Sun), a subsidiary of India's Sun Pharmaceutical Industries Ltd. The agency said it intends to continue allowing the importation of Lipodox until Sun has made enough generic Doxil to meet demand. The FDA approved the first generic version of Doxil, made by Sun, in February 2013. It will be available in 20 milligram and 50 milligram vials. 1 2 3 "(doxorubicin) dosing, indications, interactions, adverse effects, and more". Medscape Reference. WebMD. Retrieved 15 April 2014. 1 2 3 4 5 6 7 8 9 Brayfield, A, ed. (19 December 2013). "Doxorubicin". Martindale: The Complete Drug Reference. Pharmaceutical Press. Retrieved 15 April 2014. 1 2 3 Tacar, O; Sriamornsak, P; Dass, CR (February 2013). "Doxorubicin: an update on anticancer molecular action, toxicity and novel drug delivery systems.". The Journal of Pharmacy and Pharmacology. 65 (2): 157–70. doi:10.1111/j.2042-7158.2012.01567.x. PMID 23278683. 1 2 3 4 Rossi, S, ed. (2013). Australian Medicines Handbook (2013 ed.). Adelaide: The Australian Medicines Handbook Unit Trust. ISBN 978-0-9805790-9-3. ↑ "Doxorubicin: MedlinePlus Drug Information". www.nlm.nih.gov. Retrieved 2016-02-01. 1 2 "DOXIL Product Information." Ortho Biotech Products, L.P. Retrieved on April 19, 2007. Archived September 21, 2007, at the Wayback Machine. 1 2 "Liposomal doxorubicin (Caelyx, Myocet)". Macmillan Cancer Support. April 1, 2009. Retrieved 2009-11-27. ↑ "Doxorubicin liposomal". Chemocare. Cleveland Clinic. Retrieved 2009-11-27. ↑ Kaczmarek A, Brinkman BM, Heyndrickx L, Vandenabeele P, Krysko DV J (2012). "Severity of doxorubicin-induced small intestinal mucositis is regulated by the TLR-2 and TLR-9 pathways.". J Pathol. 226 (4): 598–608. doi:10.1002/path.3009. PMID 21960132. ↑ Bloch, Richard; Bloch, Annette. "25 Most Asked Questions". Fighting Cancer. R. A. Bloch Cancer Foundation. Archived from the original on June 26, 2007. Retrieved 2007-06-28. ↑ Groopman, Jerome E. (2007). How Doctors Think. Boston: Houghton Mifflin. p. 49. ISBN 0-618-61003-0. ↑ Yeo W, Lam KC, Zee B, et al. (November 2004). "Hepatitis B reactivation in patients with hepatocellular carcinoma undergoing systemic chemotherapy". Ann Oncol. 15 (11): 1661–6. doi:10.1093/annonc/mdh430. PMID 15520068. ↑ Dillon R, Hirschfield GM, Allison ME, Rege KP (2008). "Fatal reactivation of hepatitis B after chemotherapy for lymphoma". BMJ. 337: a423. doi:10.1136/bmj.39490.680498.BE. PMID 18595895. 1 2 Lomovskaya N, Otten SL, Doi-Katayama Y, et al. (1999). "Doxorubicin overproduction in Streptomyces peucetius: cloning and characterization of the dnrU ketoreductase and dnrV genes and the doxA cytochrome P-450 hydroxylase gene". J. Bacteriol. 181 (1): 305–18. PMC 103563 . PMID 9864344. 1 2 Arcamone F, Cassinelli G, Fantini G, et al. (1969). "Adriamycin, 14-hydroxydaunomycin, a new antitumor antibiotic from S. peucetius var. caesius". Biotechnol Bioeng. 11 (6): 1101–10. doi:10.1002/bit.260110607. PMID 5365804. ↑ Grimm A, Madduri K, Ali A, Hutchinson CR (1994). "Characterization of the Streptomyces peucetius ATCC 29050 genes encoding doxorubicin polyketide synthase". Gene. 151 (1–2): 1–10. doi:10.1016/0378-1119(94)90625-4. PMID 7828855. ↑ Dickens ML, Strohl WR (1996). "Isolation and characterization of a gene from Streptomyces sp. strain C5 that confers the ability to convert daunomycin to doxorubicin on Streptomyces lividans TK24". J. Bacteriol. 178 (11): 3389–95. PMC 178102 . PMID 8655530. ↑ Walczak RJ, Dickens ML, Priestley ND, Strohl WR (1999). "Purification, properties, and characterization of recombinant Streptomyces sp. strain C5 DoxA, a cytochrome P-450 catalyzing multiple steps in doxorubicin biosynthesis". J. Bacteriol. 181 (1): 298–304. PMC 103562 . PMID 9864343. ↑ Hutchinson CR, Colombo AL (1999). "Genetic engineering of doxorubicin production in Streptomyces peucetius: a review". J. Ind. Microbiol. Biotechnol. 23 (1): 647–52. doi:10.1038/sj.jim.2900673. PMID 10455495. ↑ Lown JW (1993). "Anthracycline and anthraquinone anticancer agents: current status and recent developments". Pharmacol. Ther. 60 (2): 185–214. doi:10.1016/0163-7258(93)90006-Y. PMID 8022857. 1 2 Frederick CA, Williams LD, Ughetto G, et al. (March 1990). "Structural comparison of anticancer drug-DNA complexes: adriamycin and daunomycin". Biochemistry. 29 (10): 2538–49. doi:10.1021/bi00462a016. PMID 2334681. Crystal structure is available for download as a PDB file. ↑ Fornari FA, Randolph JK, Yalowich JC, Ritke MK, Gewirtz DA (April 1994). "Interference by doxorubicin with DNA unwinding in MCF-7 breast tumor cells". Mol Pharmacol. 45 (4): 649–56. PMID 8183243. ↑ Momparler RL, Karon M, Siegel SE, Avila F (August 1976). "Effect of adriamycin on DNA, RNA, and protein synthesis in cell-free systems and intact cells". Cancer Res. 36 (8): 2891–5. PMID 1277199. ↑ Pommier, Y; Leo, E; Zhang, H; Marchand, C (May 2010). "DNA topoisomerases and their poisoning by anticancer and antibacterial drugs.". Chemistry & Biology. 17 (5): 421–33. doi:10.1016/j.chembiol.2010.04.012. PMID 20534341. ↑ Pigram WJ, Fuller W, Hamilton LD (January 1972). "Stereochemistry of intercalation: interaction of daunomycin with DNA". Nature New Biol. 235 (53): 17–9. doi:10.1038/newbio235017a0. PMID 4502404. 1 2 Pang B, Qiao X, Janssen L, Velds A, Groothuis T, Kerkhoven R, Nieuwland M, Ovaa H, Rottenberg S, van Tellingen O, Janssen J, Huijgens P, Zwart W, Neefjes J (2013). "Drug-induced histone eviction from open chromatin contributes to the chemotherapeutic effects of doxorubicin". Nature Communications. 4 (5): 1908. doi:10.1038/ncomms2921. PMID 23715267. 1 2 Weiss RB (December 1992). "The anthracyclines: will we ever find a better doxorubicin?". Seminars in Oncology. 19 (6): 670–86. PMID 1462166. ↑ Tan C, Tasaka H, Yu KP, Murphy ML, Karnofsky DA (March 1967). "Daunomycin, an antitumor antibiotic, in the treatment of neoplastic disease. Clinical evaluation with special reference to childhood leukemia". Cancer. 20 (3): 333–53. doi:10.1002/1097-0142(1967)20:3<333::AID-CNCR2820200302>3.0.CO;2-K. PMID 4290058. ↑ Di Marco A, Gaetani M, Scarpinato B (February 1969). "Adriamycin (NSC-123,127): a new antibiotic with antitumor activity". Cancer Chemother Rep. 53 (1): 33–7. PMID 5772652. ↑ "Drug Shortages, doxorubicin". US Food and Drug Administration. Retrieved 2014-02-22. ↑ Peter Loftus (2011-07-21). "J&J is Short of Cancer Drug Doxil". Wall Street Journal. ↑ "Ben Venue Laboratories – Voluntary Shutdown". US Food and Drug Administration. 2011-11-30. Retrieved 2014-02-22. ↑ Harris, Gardiner (2012-02-21). "Shipments From Abroad to Help Ease Shortage of Two Cancer Drugs". New York Times. Retrieved 2014-02-22. ↑ Yukhananov, Anna (2012-02-21). "FDA acts to stem shortages of two cancer drugs". Reuters. Retrieved 2014-02-22. ↑ "FDA NEWS RELEASE". US Food and Drug Administration. 2013-02-04. Retrieved 2014-02-22. ↑ Johansson S, Goldenberg D, Griffiths G, Wahren B, Hinkula J (2006). "Elimination of HIV-1 infection by treatment with a doxorubicin-conjugated anti-envelope antibody". AIDS. 20 (15): 1911–1915. doi:10.1097/01.aids.0000247111.58961.60. PMID 16988511. ↑ Friedman R, Caflisch A (2009). "Discovery of Plasmepsin Inhibitors by Fragment-Based Docking and Consensus Scoring". ChemMedChem. 4 (8): 1317–26. doi:10.1002/cmdc.200900078. PMID 19472268. ↑ Gamo F-J; et al. (2010). "Thousands of chemical starting points for antimalarial lead identification". Nature. 465 (7296): 305–310. doi:10.1038/nature09107. PMID 20485427. ↑ Karukstis, K., Thompson, E., Whiles, J. & Rosenfeld, R. Deciphering the fluorescence signature of daunomycin and doxorubicin. Biophysical Chemistry 73, 249-263 (1998). ↑ Mohan, P. & Rapoport, N. Doxorubicin as a Molecular Nanotheranostic Agent: Effect of Doxorubicin Encapsulation in Micelles or Nanoemulsions on the Ultrasound-Mediated Intracellular Delivery and Nuclear Trafficking. Mol. Pharmaceutics 7, 1959-1973 (2010).